Games are a great way to get people to learn, and the Piedmont Chapter has invented a cool (tested!) 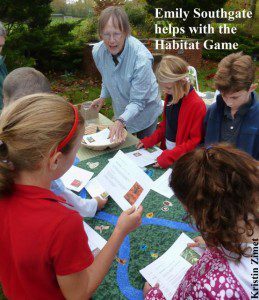 activity to teach the concept that our choices in landscaping make a difference, and why. This article first appeared in the Chapter’s Winter newsletter, The Leaflet. We’re happy to have the opportunity to spread the idea a little farther by afield here! 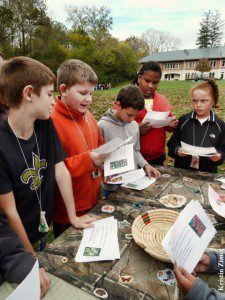 For several years now Clarke County 4th graders have been invited to attend the Clarke County Conservation Fair, a day of learning about environmental topics at Powhatan School near Boyce. Students move in groups of up to 20 from one activity to the next, and are at a station for about 25 minutes. 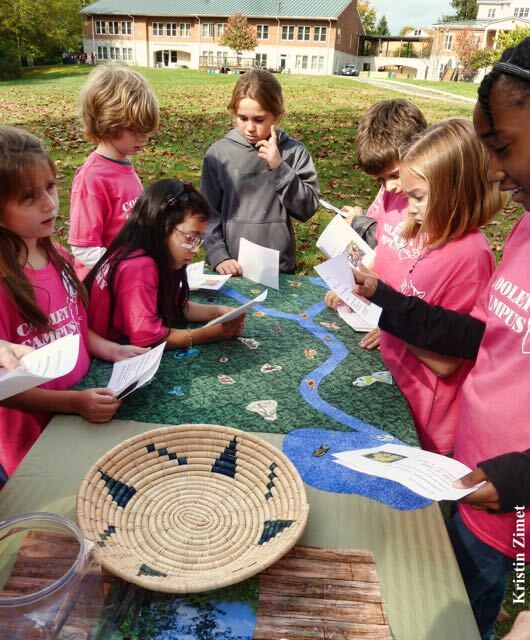 The challenge is to engage them in an activity that teaches them something about nature and/or conservation and perhaps show how they can impact their environment. The Piedmont Chapter has attended several times. Our previous activity was a skit about invasive plants, with active participation from the students. This year the organizers declared a theme, Habitat. So we decided to invent a new activity. Led by board member Kristin Zimet, Emily Southgate, Mary Keith Ruffner, Jocelyn Sladen, Carrie Blair, and Sally Anderson met several times to hash out details. 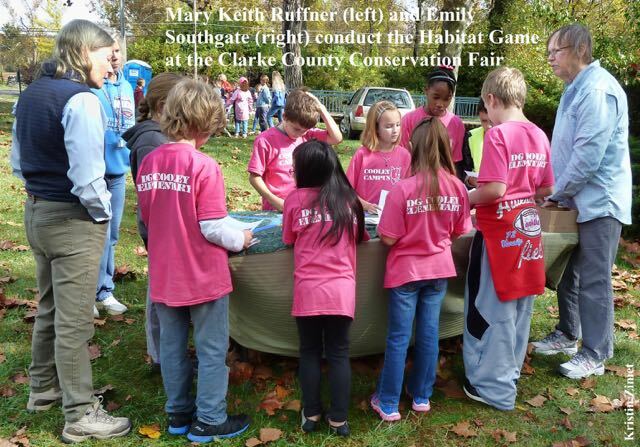 The result is The Habitat Game. It evolved from boxes of dirt through a three dimensional habitat, and finally ended up being table cloths using various fabrics to represent habitat features, and lots of wildlife, realistic and otherwise. A yard and house were added, since one of the ideas we most wanted to get across was (“let’s hear it kids”) Your Choices Matter! Cards for the game were native, non-native and invasive plants that could be chosen for a yard. Tokens were awarded for helpful choices, and taken away for choices that might negatively impact the adjacent woodland (in the Wildwood Acres neighborhood) or wet woodland (at Flowing Springs Estates). Making the cards was an amazing exercise for all of us. We had to choose and research the plants, which meant looking up wildlife benefits, soil and water impacts and so on. I think both the committee and the chapter board, who tried out the game at a meeting, learned a lot of things. Part of what we learned is just how much there still is to find out about the plants we love. The ones we don’t love were easier, but still presented challenges, because even invasive plants can provide food and cover for animals. The Habitat Game engendering high level thinking and discussion! My biggest worry was that the game would be too long and complicated for the time allotted, but on the gorgeous fall day, with a backdrop of a running stream, bird song and some Oriental Bittersweet as a good demonstration, we had five classes of students gather around our two habitats and complete the game. It was really fun to assist as they negotiated with each other on which 15 plants to choose. They took it quite seriously (for a game), reading cards aloud, advocating for the plants they liked and adding up the tokens. They were knowledgeable about what constituted habitat, and we had time to discuss their choices and count up the tokens they won. A good time was had by all. Sounds like great fun! Way to go, Piedmont Chapter! Ann, we’ll pass this along to the folks who invented the game.